I was invided to show off my work at Brookside Golf & Country Club Bridal open house last month because I am a prefered vendor there. I took some photographs outside and in showing off the beautiful venue and surroundings. I also took some video when the open house was going on. Scroll down to view the video I made for Brookside and the photographs I have taken there. If you are engaged and in Ohio please visit me at the Columbus Bride: Bridal Show. The show starts this Saturday, Jan. 3, 2009, from 10 a.m. to 5 p.m. and continues until Sunday, Jan. 4, 2009, noon to 5 p.m. Admission is $10 at the door or $7 if you register at http://columbusbride.com/register.html At the show you will be able to view all of my new sample albums, proof books, memory coffee table books and my soft cover engagement books. I would also like everyone that is going to the show please visit vendors I trust such as Cuas of Columbus, Bonnie's Cakes, Mass Appeal Dining Service and The Medallion Club. There are a few other vendors I trust that are not attending the show that are listed on my vendors page. I will be the second booth in from the center of the stage. I do love going to bridal shows meeting new people and other wedding vendors networking with everyone I can. I will be twittering myself at the show so keep an eye out for that. I hope to see you at the show. 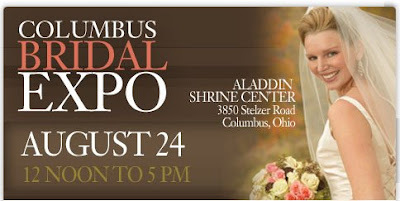 Kellogg Photography will be attending the Columbus Bridal Expo on August 24th from 12 to 5pm. This will be at the Aladdin Shrine Center at 3850 Stelzer Road, Columbus in the Easton Towne Center Area. This will be a great time to see our work and ask any questions you might have. This show is dedicated to brides that want to view wedding vendors for their winter wedding or 2009 wedding. Please visit my website www.briankellogg.com for contact information.